I'm thinking maybe when we return to the US, my next career will involve profiting off the blog posts written while not sleeping on overnight trains that are zooming through Southeast Asia. To move along on that career path, let me share our current train experience. We're heading from Nha Trang to Danag, north along the Vietnam coast. 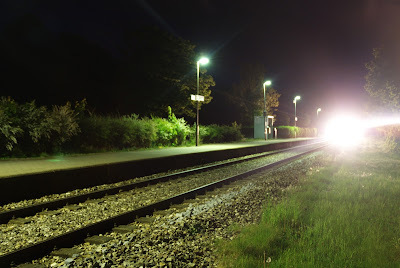 We had heard (but not heeded) the warning that the trains fill up, so when we went to buy our tickets, all the soft sleepers were full and we would need to take the hard sleeper. Our hotel lady who sold us the tickets explained that instead of a thick, fluffy mattress, it's just a little thinner. She gestured it to be the thickness of a Japanese futon...I can handle that. But boy was she flattering the state rail system! We arrived to the station, boarded our train, and found that the hard sleeper ticket involves a private cabin with 6 bunks, 3 on each side, stacked floor to ceiling. And the futons I was looking forward to are more like decorative (and thin) Persian rugs on a slab of metal. Oh, and there's not enough room to sit up in bed, but reclined on a hard surface we will be. I was suddenly so thrilled that our journey would take a whole 11 hours! We met our bunk mates for the trip. One was a fairly surly older Vietnamese gentleman who yammered on his phone for the first hour or so. On the top bunks was a young Vietnamese couple who kindly explained that we were too big: "these trains are made for Vietnamese!" (Yes, I'm aware of that because I cannot sit up in bed!). But I was endeared to him when he got my attention by calling me "Miss America!" Our last roommate was a young Australian guy by the name of Wade, wearing salmon colored Bermuda shorts and a tank top (with big armholes...yuck) that said "DORK" across the front. Wade found Cory quite charming, as his first questions were "so, she's your girlfriend?" "Nope, my wife." A few minutes and some chatting later, "so, she's your girlfriend?" "Nope, we're married. She's my wife." Wade: so are we going to go get drunk, or what?" Cory: "uh, I guess." They leave to explore the train and find a beer. They return 15 minutes later, beers in hand, and I hear, "so, are you guys going to get married?" Seriously, dude!! Then I realized there's something wrong with Wade on the bigger scale. Not sure exactly what, but an hour into the ride, he fell asleep (luckily on the bottom bunk), and fell out of bed! Seriously, it's not that hard to stay in your bed, even on a moving train. But I knew something was amiss because once he woke up and realized he was on the fairly nasty floor of a Vietnamese train (sans pillow), he decided to stay. And that is where he remains, snoring cheerfully, as we barrel down the tracks. On a side note, I'd love the use the restroom. However, when your husband goes to investigate it, returns, and looks into your eyes meaningfully and says, "do not need the bathroom on this train" you cap your water bottle and hope for the best. You should try the night bus, which we took from Hoi An to Nha Trang. Talk about sleep...no way. But an interesting experience. I laughed out loud more than once reading this.